"IT IS THE FUTURE THAT CREATES HIS PRESENT"
TYPICALLY, WONDERFULLY FROST. I came across this 1962 poem while reading Robert Frost. It is from his collection "In the Clearing," which also includes his poem written for the inauguration of John F. Kennedy. Not sure exactly to whom or what Frost is referring in this piece. Coming as late in his life as it does, and amid the fresh notoriety and accompanying scrutiny he received that year, I wonder if he refers to himself? This is so typically, wonderfully Robert Frost. IN HONOR OF BOBBY KENNEDY. Today, I frame it in memory of of that incredible seeker Bobby Kennedy, who was assassinated in the early hours of this day 40 years ago. I was nine years old, but remember waking up to the tragic news and amazed at the grieving it caused in so many people. Only much later would I begin to understand something of the impact of that event and what Bobby Kennedy positively represented for many people. This poem seems a fitting description of him. 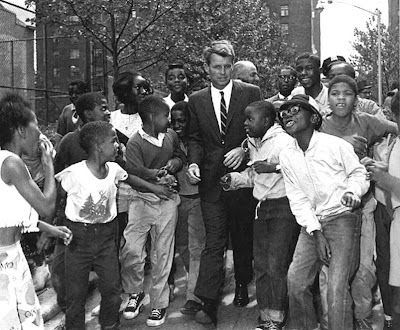 FYI: There is a wonderful photo gallery of previously unpublished pictures of Bobby Kennedy by Life photographers at www.time.com today.